Having grown up in a Deaf family in Riverside, California, David J. Kurs had a "culturally rich" upbringing, with lots of access to the lively ASL-theater and interpreted-theater scene in Los Angeles, but wasn't sure about job opportunities, so he majored in Marketing at Gallaudet University. After graduating, he worked as a freelance writer, producer, and filmmaker.. "One year after graduation, I moved to LA and decided to find a job in the creative industry," he told Julio Martinez in 2012. "I ended up as a script reader. This job was a gateway for me, and it was at this time that I became passionate about the power of the arts and the media in changing the publiic perception of the Deaf community." Deaf West Theatre in Los Angeles, founded by Ed Watersteet in 1991, has had a notably successful career as an ASL theater, establishing partnerships with other theaters such as Fountain and City Theater Group. Its 2001 production of Big River, an intermodal musical, proceeded to the Mark Taper Forum, then to Broadway, getting nominated for a Tony Award for Best Musical. As Deaf West's Artistic Associate, Kurs wrote and produced a multimedia show for young audiences, Aesop Who? (2008). He served as aassociate producer and ASL master for iDeaf West's productions of Children of a Lesser God (2009), My Sister in This House (2010), and The Adventures of Pinocchio (2011). He's maintained an active presence in the local and national Daf community; he also served as president of GLAD's Board of Directors. 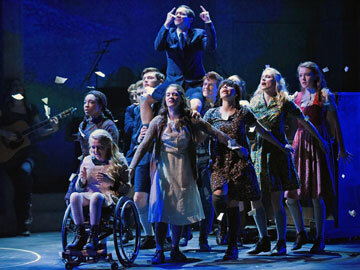 Deaf West's 2015 production of Spring Awakening, an intermodal rock-musical adaptation of a controversial late-19th-century German play about growing up in a sexually repressive culture, had an extended run, and is headed for Broadway. Of his plans for Deaf West, he told Martinez, "I want to find ways to bring theater into their homes, to expose deaf children to the potential of the stage so that they may begin to explore it on their own. It’s a very accessible art with deep roots in our community, and it saddens me that sign language theater is not nearly as prevalent as it once was. I was so fortunate to be exposed to so much sign language theater while growing up: community and high school productions, international deaf culture festivals, touring productions of the National Theatre of the Deaf, and most of all, Deaf West’s many productions. And video is one possibility of achieving that exposure. He told Bill O'Brien in 2014: "In this age of Facebook and videophones, there aren’t very many reasons for our community to gather, and I’m very proud of the sense of community that our theater fosters. We truly excel in audience development, and a sizable portion of our audience has never seen a Deaf West show before. Our loyal patrons come out to the theater partly because they’re always curious about the new deaf actors that we cast, or the deaf designers and crew that worked to make the show a reality. We are very passionate about putting deaf artists to work because there are so few venues for them to ply their craft, and because we want to show the world how it’s done, especially here in Los Angeles where there is so much proximity to film and television production." Quotationst taken from: Julio Martinez, "David Kurs—a New Leader for Deaf West, This Stage Magazine, March 7, 2012 (http://thisstage.la/2012/03/david-kurs-a-new-leader-for-deaf-west/), and Bill O'Brien, "DJ Kurs/Deaf West Theatre's Signs of Community," NEA Arts Magazine, No. 2, 2014 (http://arts.gov/NEARTS/2014v2-story-our-culture-arists-place-community/dj-kurs-deaf-west).